SHADOWRUN. The Sixth World. Orks in pinstripe suits with uzis: mohawked dwarves jacked into vehicles racing through megasprawls at breakneck speed: humans casting fireballs at corporate-trained paracritters: elves hacking the Matrix for a datasteal of the latest tech or working to topple an upstart corp. It's where man meets magic and machine. Dive into a cyberpunk dystopia and become a shadowrunner, a deniable asset who does the jobs no one else can - or will - do. It's not an easy life, but it beats selling your soul to the megacorps. You'll break into top-secret labs, stand up to gangs bent of destruction and chaos, encounter dark spirits hiding even darker secrets, and come face to face with some of the infinite dangers the Sixth World can throw at you. And you'll come out on top - because if you don't, you don't get paid. 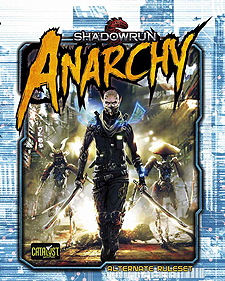 Shadowrun: Anarchy is a new way to get into the best cyberpunk/urban fantasy action around. Based upon the rules-light and easy-to-learn Cue System. Shadowrun: Anarchy is a narrative-focused game experience that has everything you need to quickly grab some gear, load up on spells, and get to throwing the die. With loads of characters and missions, the book makes it simple to get up and running. Immerse yourselves in the Sixth World!